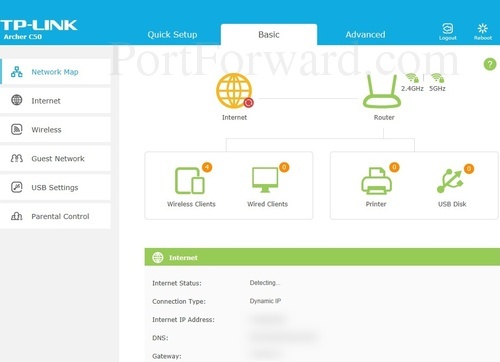 In this guide we will be explaining how to port forward on the TP-Link Archer C50 router. Your router has a basic firewall in place designed to block unwanted Internet access. Sometimes you want some of these blocked connections to the Internet unblocked. This process of unblocking the connections is called opening a port or more often a port forward. We will walk you through every step in the process of opening ports for your TP-Link Archer C50 router. Setup a Static IP address on the device or computer you want these ports forwarded to. Login to the TP-Link Archer C50 router. In this step we show you how to login to the TP-Link Archer C50 router. Your router has a web interface meaning you need to use a web browser to login. Go ahead and open a web browser. It doesn't matter which browser you decide to use. Simply pick your favorite. Some of the more common browser choices are: Internet Explorer, Firefox, Safari, and Chrome. If you see an image like the one above, you are in the right place. After entering the username and password, press the green Login button to access the TP-Link Archer C50 web interface. First of all, be sure you did not enter the WiFi username and password in these boxes. That username/password combo is completely different. Second, try other common TP-Link username/password combos. Sometimes a router manufacturer changes the username and password with a firmware upgrade. Try these Default TP-Link Router Passwords. If that did not work, it is probably because you changed the username and password in the past and don't recall what you changed it to. If this is the case, try our Find Password App. It helps you figure out what you changed the password to. Learn more about this on our Router Password Cracker page. Finally if nothing else is working it might be time to consider a reset. A factory reset like this erases all personal settings including but definitely not limited to the password/username combo. If a reset is something you must consider, follow the instruction on this page. Now let's get you to the port forwarding section of the TP-Link Archer C50 router. To do that we need to start on the Network Map. On this page, click the option at the top of the page labeled Advanced. Now click the option of NAT Forwarding in the left sidebar. A new set of choices appears under that, choose the new option of Virtual Servers. Make up a name to put in the Service Type box. The name does not have any effect on the functionality of the forward, it's simply there so you can know why it was created. 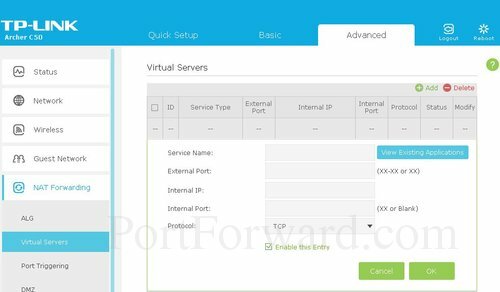 Enter the IP address to forward these ports to into the Internal IP box. If you are forwarding ports so you can run a program on a device other than your computer then you can enter your device's IP address into that box. Enable the Enable This Entry checkbox by putting a check in it. Make sure that between each entry click the green OK button. That's it, you did it. Don't forget to test the ports and see if they were forwarded correctly. In order to do this we recommend using our Open Port Checker. It is completely free if you get it in our Network Utilities trial version. Our port checker is guaranteed to work because it uses a local application to listen for the server trying to connect. This way we can confirm whether or not your port is forwarded. 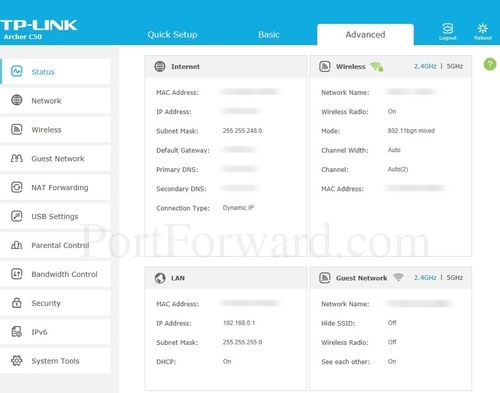 If this guide did not answer a question you had about port forwarding the TP-Link Archer C50 router please take a look at our forum. There is a good chance the question has already been raised. There are a lot of knowledgeable people on our forum ready to answer your questions. More Router specific guides on our setuprouter.com site.